This portable space heater features 3 heat settings with easy to use controls to operate and change these temperatures. It comes with ceramic heating plates and the built-in ignition button means there is no difficulty getting the heater started. 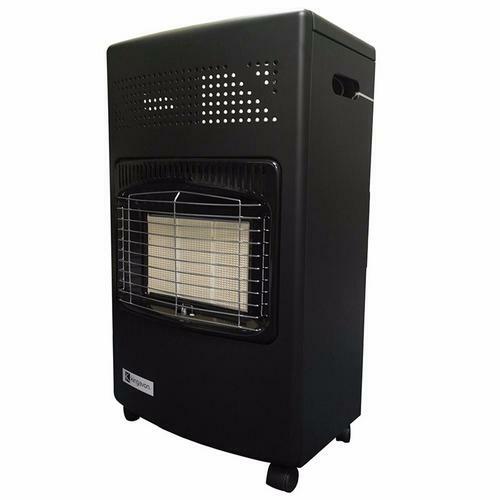 This product is ideal for use in commercial or personal use where heating a large space is necessary. The BB-PG150 has a high thermal efficiency which means that this heater works better at higher temperatures as indicated by the gas consumption rate in relation to the power being used. This heater is easily moved around with the sturdy wheels/casters used to make this gas cabinet heater portable. The BB-PG150 also has an anti-tilt safety system which will turn off the heater if it is knocked or falls over ensure that no fire damage is caused to the unit or to the surrounding area. Comes with the choice of either the UK or Irish Regulator. What is the fitting on the butane gas bottle for this heater? Electrical World Replies: Hello, i know people who have done this and it works fine but this would be at your own risk knowing the following, the manufacturer wont stand over doing this as they haven't tested it with propane.